VW Bus Movie Sighting - Do you know what movie? 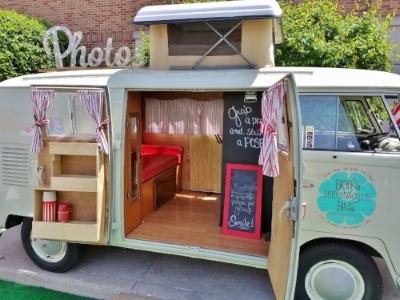 Can you guess what movie this VW Bus made a celebrity appearance in? Check out this cool project being done for the 50th Anniversary of Woodstock. 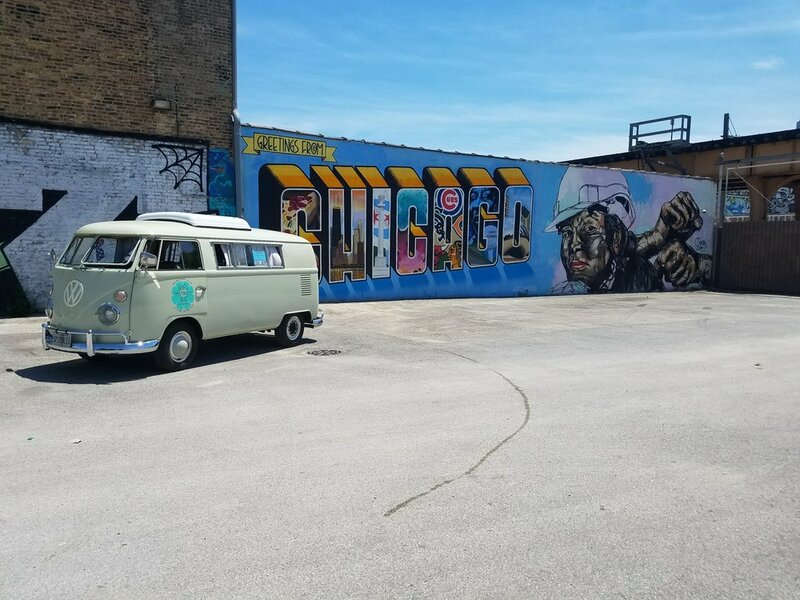 If they tour through Chicago on the way to Woodstock, we just might join them! Note: I do not believe that my 1967 VW Bus was at Woodstock but you never know. By the time the 1960's counter-culture movement reached its peak the Volkswagen Type II, or microbus, had been around for nearly 20 years. The simple cheap bus was the perfect vehicle for bands, hippies on the road, communes and intentional communities, to transport the belongings of their simplified lives, and the message of their philosophy - peace, love, and understanding. With an air cooled engine of less than 100 horsepower, box-like design, and flexible open interior, no vehicle could have been more different than the high horsepower muscle cars of the era. 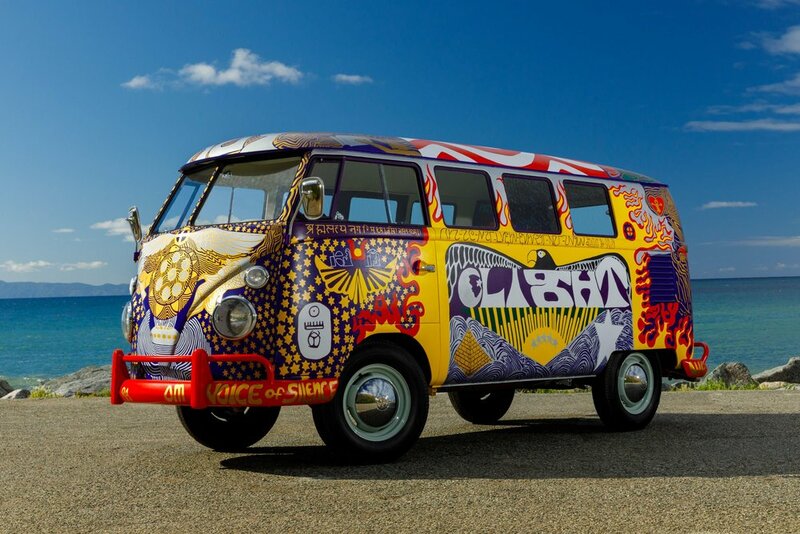 Dr. Bob Hieronimus was commissioned to paint the Woodstock Light Bus for his friends in the great Baltimore-based rockband Light. 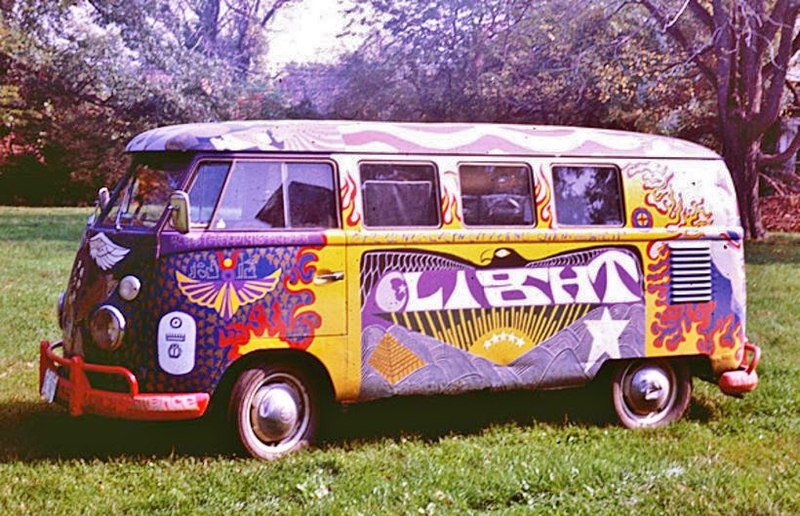 In the summer of 1969 Dr. Bob designed and painted the bus by a lake outside Baltimore. Its first great journey turned out to be one of America's greatest journeys - to the music festival known today around the world simply as Woodstock. The VW bus became a classic design icon, rich in romantic associations, symbolizing fun, freedom and adventure. At Woodstock the Light Bus captured the spirit of the event and the whole counter-culture movement. Parked in poll position near the main stage the Light Bus was photographed by Associated Press, Rolling Stone and Life magazines. 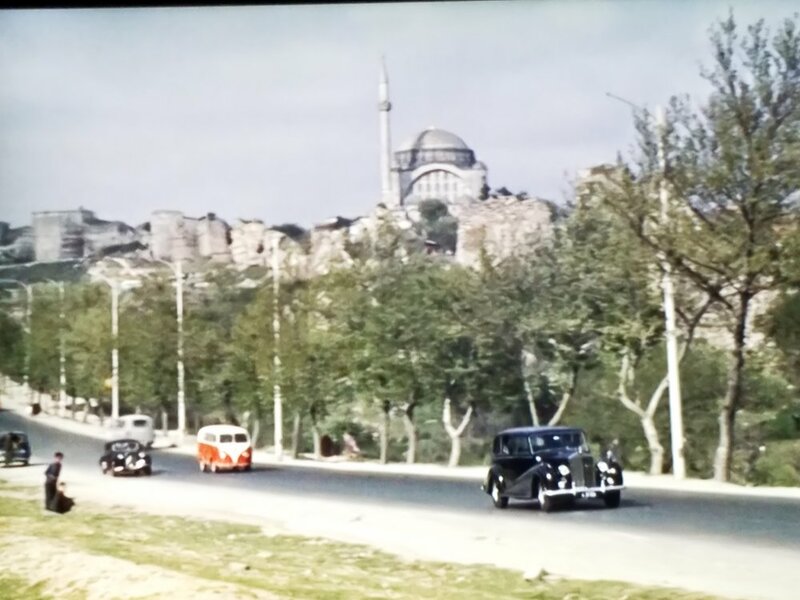 The symbol covered bus became the symbol of an event that in turn became the symbol of an era. Music, art, cinema, radio, social action, technological change, and new experiences combined to point to an open road headed in a new direction that could be summed up in one word - Peace. In the decades since then the promise of peace has waxed and waned. The innocent hopefulness of the counter-culture has evolved into movements, more new ideas, and ideology. There have been backsteps and great leaps forward. But through it all the Volkswagen Type II Bus has continued to be the official vehicle of Peace. Tens of thousands of them, filled with the spirit of Woodstock wander the open roads of the world, kept running by young mechanics and new generations of people filled with hope for a better future. They were allowed to drive through. But in reality there was no art exhibit. As the rain and mud increased over the next three days, the bus would prove an invaluable shelter to them, and many other passersby. Several famous musicians were said to have huddled inside for a few minutes. Grimm and friends parked the bus up the tree-lined dirt road, near the portable toilets on the hill to the left of the stage (“stage right”). The first day offered them a great view of the stage from the front window of the VW. Later they took to sitting on its roof, which is where Trudy and Ricky were sitting when the Associated Press photographer captured their famous image. Upcoming Events Sept. 30th and Oct. 6th. Jamming with The Jam on the WCIU "The U"